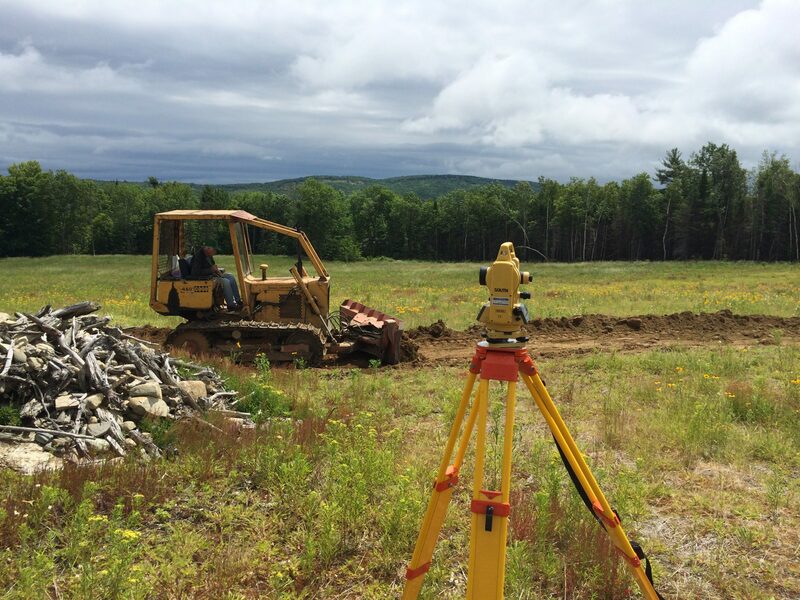 In early July of 2015, two of Regenerative Design Group’s ecological designers, Keith Zaltzberg and Josiah Simpson, traveled to Montville, Maine to oversee the construction of slope-stabilizing water harvesting earthworks on a steeply sloping sixty-acre parcel known as the Halldale Hillside. 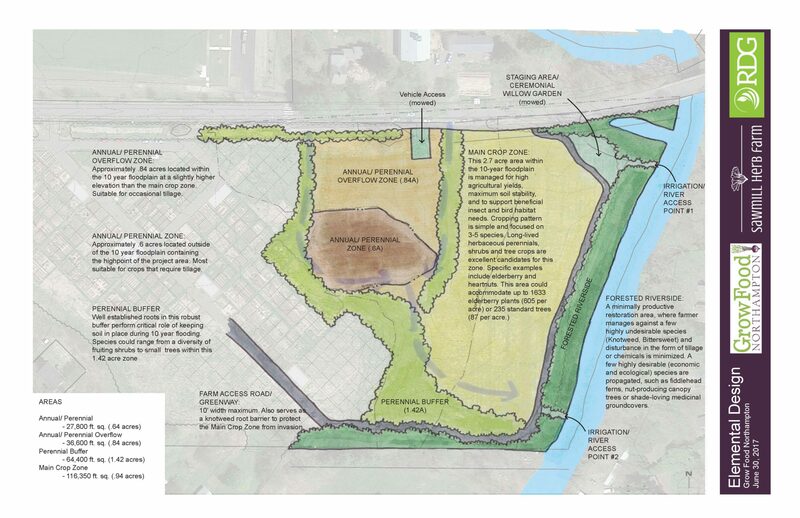 This was the second phase of a multi-year plan to reclaim a denuded and eroding hillside and create a stable and inspiring landscape that protects local waterways, provides wildlife habitat, and produces fruits, nuts, herbs and flowers that invite humans and other animals to forage, hunt and contemplate the beauty of this place. Looking from the bottom of the Halldale Hillside to the ridge, fall 2014. 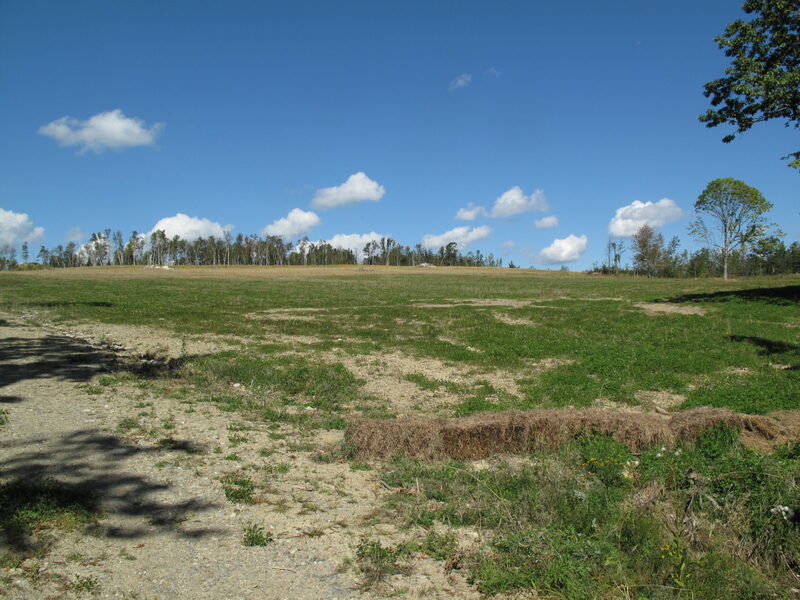 Many bare spots leave the hillside susceptible to erosion and soil loss during every rain event. The Halldale Hillside is the site of a failed subdivision. The parcel was clear-cut, the topsoil bulldozed (exposing the mineral subsoils), and a poorly engineered dirt road was built. When Regenerative Design Group at the site in the fall of 2013, the exposed soils and road were rapidly eroding by rain and blowing away in the wind. The ground was devoid of plant life since the topsoil was gone and with it the site’s entire seed bank. Phase one of the Halldale Hillside repair began in the spring of 2014 and involved the planting of over 100 pounds of pollinator and pasture seed mix across the site to help stabilize the soil and begin nurturing the development of topsoil. Even with stormy weather that washed many seeds away the seed mixes germinated successfully. By July, wildflowers like rudbeckia, vervain, and blazing star were blooming and native grasses had established a firm root mass. To overcome the drainage issues that were continuing to compromise the hillside, Josiah and Keith designed a network of diversion and infiltration swales. These simple swales are engineered to slow the flow of water, spread it out and distribute it across the hillside, and infiltrate it into the ground. This network of swales simultaneously diverts water from erosion channels and creates a passive irrigation system to support the future vegetation of the hillside. A bulldozer constructed a bulk of the earthworks, approximately 400 feet excavated per hour, July 2015. 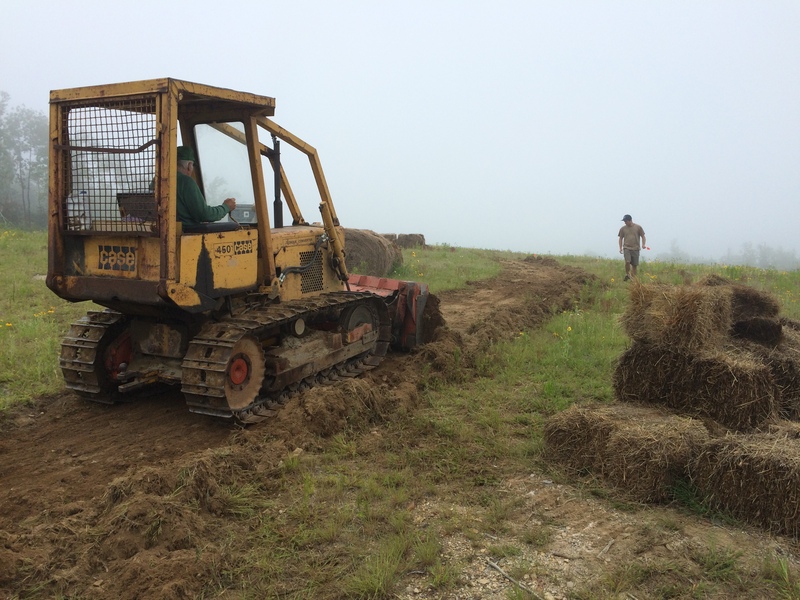 Over 1000 linear feet of swale were formed using a bulldozer, excavator, and 10 volunteers from the Waldo County Permaculture Community. Using a transit to check elevations, the team was able to pitch the swales just off contour at .5%-2%, which allows water to infiltrate in the swale basin but still move across the landscape very slowly. The spillways for each swale were hand graded into level spreaders that evenly overflows water down hill to the next swale. After construction, the swales were seeded with cover crops to help with soil stability and nutrient improvement. A surprise thunderstorm dumped an inch of rain in twenty minutes, but the swale network held together with no breaches. Josiah and Keith used a transit to measure subtle elevation changes in the swales to simultaneously move water across the hillside and infiltrate it. A profile of a swale shows a gentle cut into the hillside and wide basin. The wide berm retains 6 inches of standing water with an overall capacity of 7000 gallons (not including infiltration) within this 150-foot long swale. 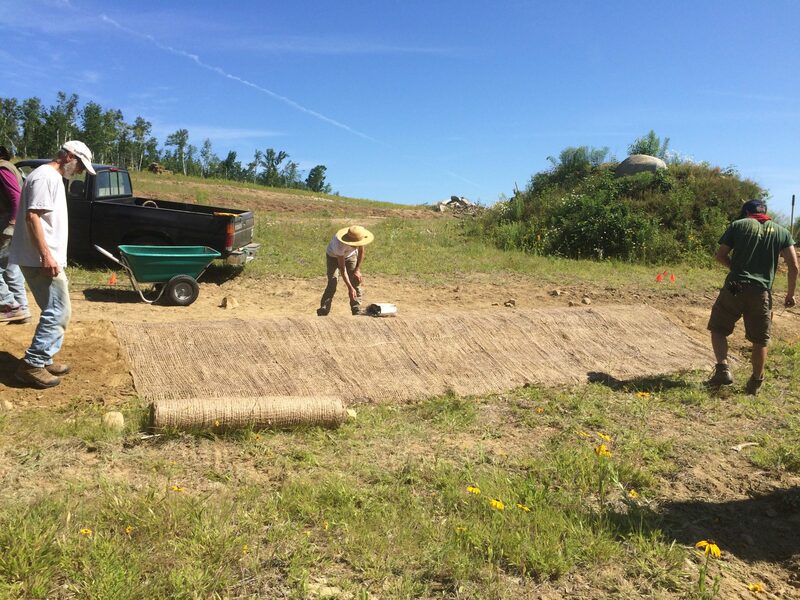 Josiah shows volunteers how to construct a level spreader spillway reinforced with jute netting. The spillways were armored with riprap (not shown) to increase the stability of the spillway during storm events. Two other swales can be seen uphill. 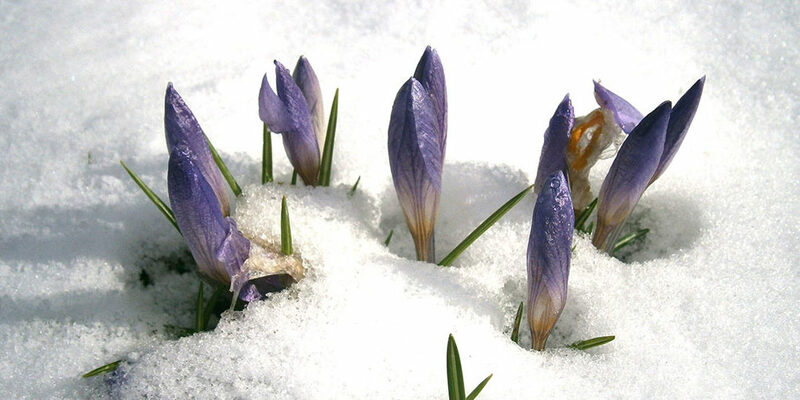 Phase three, scheduled for spring 2016 will involve forestry style planting of native and productive species such as hybrid chestnuts and hazels across the Halldale Hillside. An interesting and challenging project! Your strategy of dispersed infiltration in a network of hillside swales is new to me. What is the soil texture, and is there underlying hardpan or bedrock? If not out of range, another nut bearing tree you might try hickory . They are often common, even dominant, on droughty, Connecticut upper hillsides. Are you too far north for black, bear or chestnut oak? Thanks for your questions and comments @Sigrun Gadwa! The soil on the site is a mix of the B and C horizons, which appear to be primarily sandy with some silt with a light mixture of stones smaller than a baseball. 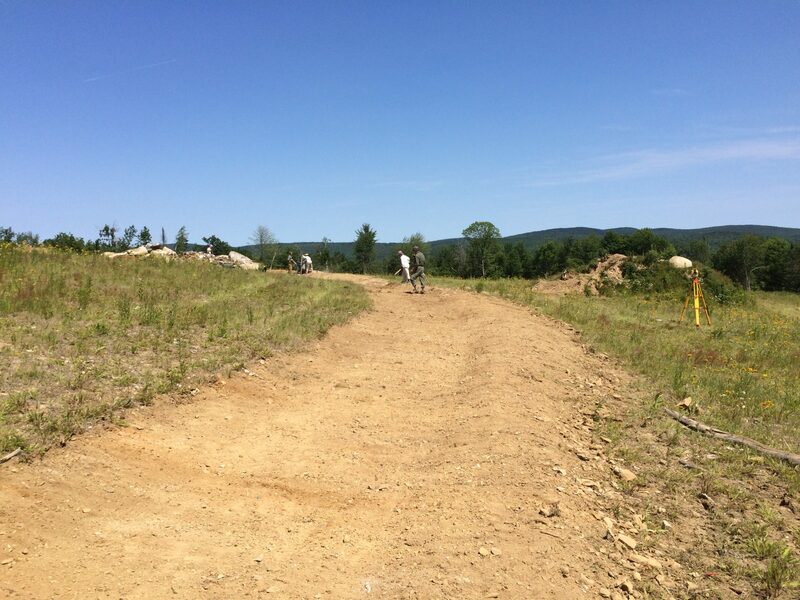 The depth of the soil varies from being very shallow with exposed bedrock ledge in some locations along the ridge to being quite deep perhaps as much as 36-40 inches especially at the “key line” of the hillside where the slope turns from concave to convex. Since the site was mutilated by the former owner who sought to develop the land, some areas at the bottom of the hillside have as much as six to eight feet of top soil because it was all pushed from the slope down to the bottom. As for plant selection, we are very keen on nut masts both from trees and shrubs. Shagbark hickory (Carya ovata) will be included in the plant palette. Additional nut trees will be white and red oak (Quercus alba and Q. rubra), American Chestnut (hybridized at 98% with Chinese), and Beech (Fagus grandifolia). We will also plant a wide number of hazelnut varieties and chinquapin shrubs. While some of these trees are palatable to humans, red oak and beech are less ideal for human consumption and are actually included to provide for the turkey, bear and other mammals.